Kiss me! I'm not Irish. But you would never guess that judging by how excited I get by all things green and rainbow-y, right? I just can't stop with the shamrocks and leprechauns this year. 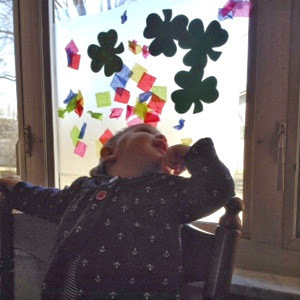 I've seriously got our whole St. Patrick's Day planned from top to bottom--food, activities, music. I'm a little holiday obsessed...just wait til Christmas! After speed mopping the kitchen floor with a real mop for the first time in a month (after that long, the Swiffer is just wiping the dirt off the tile and into the grout), folding laundry, cleaning up endless toy messes, doing the dishes and making breakfast and lunch, I decided we needed a stress and, more importantly, mess-free activity. 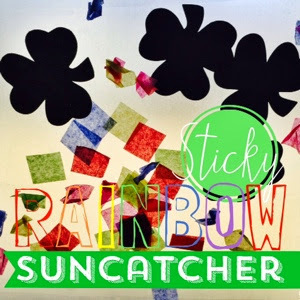 What better way to enjoy the sunshine from indoors where it's warm than to make a pretty suncatcher? 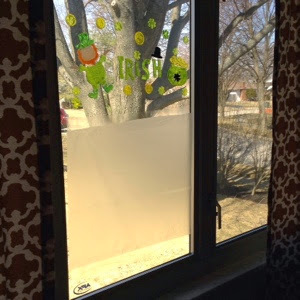 All I did to get started was cut a piece of contact paper to fit the window and stuck it to the window with the packing tape. Make sure your sticky side is facing out, not stuck to the window. 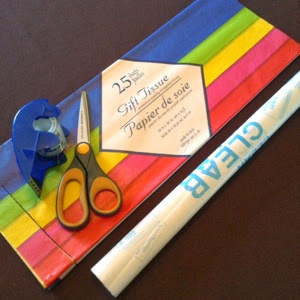 Next, I cut the tissue paper into squares. 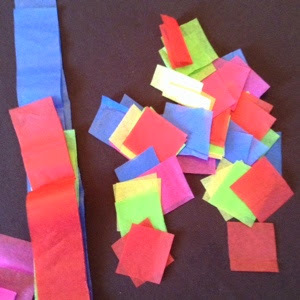 I just cut a strip about an inch and a half wide off the whole package of paper--you can see what I mean in the supplies picture. I didn't even use that whole chunk of paper. SuperBaby has a very short attention span and I didn't think we would need a ton of squares. Time for Kinley to do her part: sticking! She loved this even more than I thought she would. 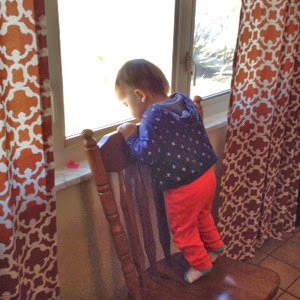 She got a thrill out of not only being allowed to stand on a chair (I stood behind her, of course,) but also being able to bang on the glass without getting hollered at. If I would've given her a handful of Garlic and Sea Salt Wavy Lays and a Sharpie, too, she would've been living a dream, I think. 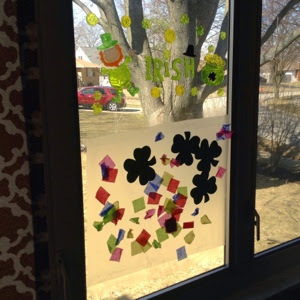 I was trying to think of something that would put a little more Paddy in our project, and I remembered the shamrocks we used in our Shamrock Soup the other day. 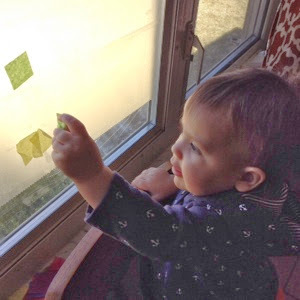 Kinley was thrilled to see those things again, and after tasting them, happily slammed those on the contact paper covered window, as well. She stood up on that chair sticking the tissue paper on and peeling it back off, and repeating that process over and over for a good 45 minutes...wayyyy longer than I thought. More Irish crafts coming tomorrow...same green time, same green channel.